Monggo Loaf Bread with soft, pillowy bread and sweet mung bean filling is a fabulous breakfast or midday snack. Enjoy a slice (or two) with coffee or tea. Hello everyone! It is me again, Sanna from Woman Scribbles. 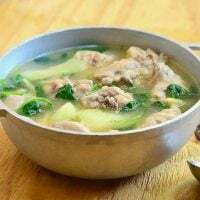 It’s been a while since my last post here on Kawaling Pinoy, and I am excited to be back with a special recipe you’ll surely love. Baking bread is my absolute favorite activity. I just love the feeling of wrestling dough with my bare hands and watching it puff up proudly as it proofs. There is no sweeter scent than the aroma of freshly-baked bread in my book! I haven’t done any baking this last month since my husband renovated our basement which happens to be the center of my baking projects but now that he’s finished with the work, I am ecstatic to jump back in. When Lalaine asked me to do a post this month, I straight away suggested monggo bread! 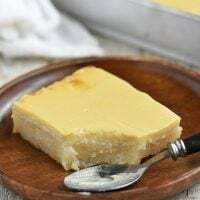 This bread loaf incorporates one of the popular dessert ingredients in the Philippines. 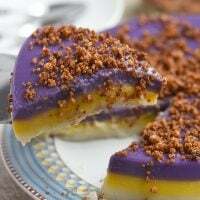 Like ube, monggo features in many Filipino delicacies. However, the type of mung bean commonly used is not the green variety we are more familiar with in our savory soups. The kind you see in your favorite sweets and baked goods is red mung beans. Also known as adzuki beans, red mung beans are a smaller variety with shiny red skin. They’re abundant in East Asia and mainly cultivated in China, Taiwan, Japan, and Korea. 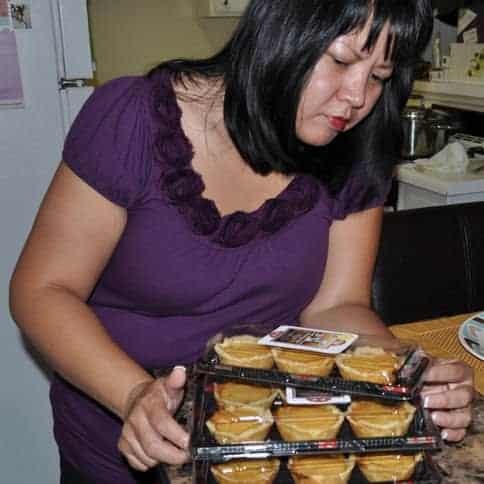 They’re also readily available in the Philippines and applied in many Filipino specialties such as buchi and hopia. I like to pre-soak the beans to help them soften quickly, but you can skip this step this step if you prefer and just cook them longer. You can make the filling a day before and store in the refrigerator until ready to use. Make sure to take it out of the fridge about half an hour before you plan to assemble the loaf so it will be easier to spread. The dough I used in this recipe is one of my favorites. It is beginner-friendly, foolproof, and requires one rise only. It bakes up soft and pillowy; the perfect canvas for the perfectly sweetened monggo filling! You can slice the loaf neatly with a knife or pull it apart with your hands for more fun. Either way, you will love it paired with coffee, tea or coke like a typical Filipino merienda. In a large mixing bowl, add flour, sugar, salt, and yeast. Whisk to combine. In a microwave-safe bowl, combine, butter, milk, and water. Microwave until butter is melted and the temperature of the mixture is at 110-115 F. If it exceeds this, cool down to the right temperature. Too hot, and you will kill the yeast. Pour the butter mixture into the dry ingredients. Using a wooden spoon, mix the ingredients until flour mixture is moistened. 1/4 cup. Set the rest aside for kneading later. Kneading is a process of working with the dough to develop the gluten which will help hold its shape and give it texture. In a floured surface, use the heels of your palms and push the dough downwards and away from you. Use the weight of your lower torso as you push the dough. Once the dough has partially flattened out, fold it in itself and repeat the pushing/ flattening motion. Use a bit of flour to prevent the dough from sticking too much to the surface and your hands. translucent window in the center. In a floured surface, roll the dough into a 14 x 10-inch rectangle. Slightly stretch the sides as necessary to make the edges somewhat straight. Spread the mongo filling over the surface. Use a spatula to even it out. Starting on the* short side of the rectangle, roll the dough, tightening it up as you go, into a log. Do it carefully to keep filling from oozing out. Using a sharp knife, divide the log into four equal portions. Score the dough first before cutting so you get nice, even cuts. Place the cut logs side up in a greased 9×5 inch loaf pan. Turn oven to 200 F and once the temperature is reached, turn off. 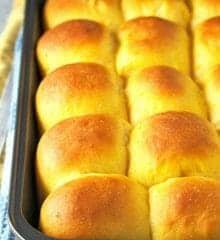 Place the rolls inside, uncovered, and let rise for about 60 to 80 minutes or until puffy and doubled in size. Take the risen dough out of the oven and preheat the oven to 350 F. Bake the loaf for about 18 to 22 minutes or until nicely golden. Check halfway through bake time and loosely tent with a foil if it’s browning too quickly. Whew, that was long! I hope you had as much fun following me through this tutorial as I had making it. Please do give this monggo bread loaf recipe a try. As a long time baker, I can’t tell you how rewarding it is to take that first delicious bite of the bread you made yourself. Priceless. If you want more bread-making projects, check out my corned beef pandesal and yema bread rolls posts. 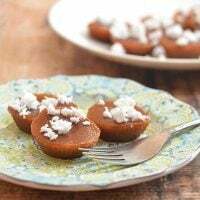 Make sure to visit my blog, Woman Scribbles, for more baking recipes. Rinse the beans well. In a large bowl, place the beans in a bowl and enough water to cover for about 2 inches. Soak overnight. saucepan and add enough water to cover for about 2 inches. Over medium heat, cook, occasionally stirring, for about 20 to 25 minutes or until tender. Let softened beans cool to room temperature. Transfer the beans to a blender and just enough liquid to help process efficiently. Process into a thick puree with little chunks of skin. In a medium saucepan, combine pureed beans and sugar. Stir until incorporated. Over medium heat, cook the mixture, stirring constantly, to a thick paste. Remove from heat and set aside. In a large mixing bowl, combine 2 1/4 cups of the flour, sugar, salt, and yeast. Whisk until well-incorporated. In a microwave-safe bowl, combine butter, water, and milk. Microwave until butter is melted and the temperature of the mixture is between 110 to 115. If too hot, cool down to the right temperature before proceeding to the next step. Add the butter mixture to the dry ingredients. Using a wooden spoon, stir the until moistened. Add the remaining 1/4 cup of flour in increments. Once the dough gathers into a rough ball and pulls from the sides of the bowl, stop adding flour. You probably won't need the entire 1/4 cup. Turn the dough over in a floured board. Using hands, knead for about 7 to 10 minutes or until the dough is smooth and no longer sticky. In a bowl, place dough and cover with a clean kitchen towel. Let rest for ten minutes. On a flat surface, roll the dough into a 14x10 inch rectangle. Using an angled spatula, spread the red bean filling over the surface of the dough to an even layer. Starting on the shorter side of the rectangle, roll the dough into a log, tightening it as you go. Be careful to ensure filling does not ooze out. Using a sharp knife, cut the log into 4 equal portions. Place them side up in a greased 9x5 inch loaf pan. Heat oven to 200 F and turn off once it reaches the temperature. Place the loaf pan inside, uncovered, and let rise in the residual heat for about 60 to 80 minutes or until puffy and doubled in size. Take the loaf out of the oven and preheat oven to 350 F. Bake the bread for about 18 to 22 minutes or until the top is nicely golden. Check the loaf halfway through bake time. If browning too quickly, loosely tent with foil. Remove from oven and allow to cool before slicing. Store leftovers in a covered container. Hi Ms. Lalaine, what kind of milk should be used? Thanks! I will try this munggo bread for may kids baon. Thank you for sharing this recipe. I tried this monggo bread and it is very delicious! thank you for the recipe! Happyto hear your feedback, Ella! I am glad you enjoyed the recipe. Just woow!!!! Love your bake goods, Sanna. This is one of my fav bread and that looks super yummy!thanks for sharing.. Yes, it does look so yummy. 🙂 Hope you give the recipe a try.